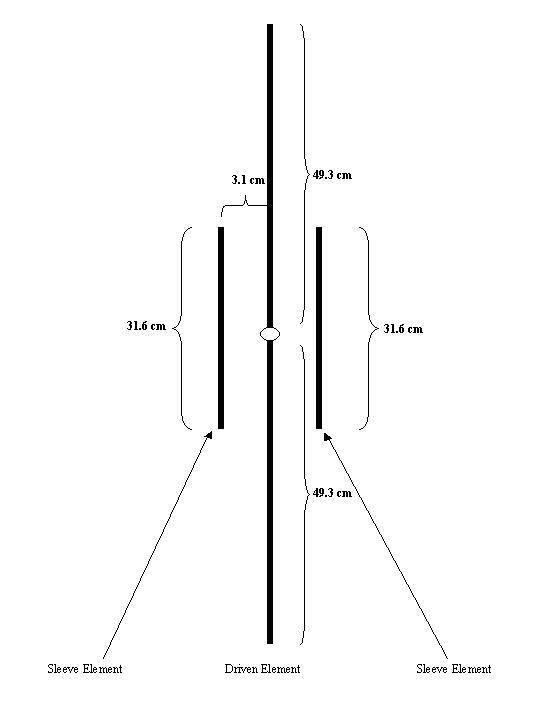 i am thinking of putting a wire dipole for 2mt and 70cmt , i have seen people say 18 inches up and 18 inches down would this be about right ??? 1/2 wave dipole (feet) = 468 / frequency in MHz. 468/145MHz = 3.227ft =38.7inches so aprox 19 5/8" inches each leg. 468/435MHz = 1.075ft 12 3/4 inches so 6 3/8" inches each leg of dipole. You will have to trim it for exact match I wouldnt use thin wire though I would use say 10mm or 3/8" aluminium tube the thicker the tube the wider the bandwidth it covers and the shorter it will need to be trimmed for a good match. Thanks Chris ,i know this makes me look thick but can you please give me a little more details as to build this antenna , I do not understand the driven/sleeve elements ??? I built this antenna from 1/4 inch copper brake pipe widely available. 2 plastic water pipe pieces to keep sleeve elements in proper distance. You just drill 2 holes in plastic pipe and put copper elements through. You connect coax to longer elements, hot to the top, braid to bottom. Do not forget to put some ferrite clamp-on cores on coax. We do not want it to be a part of antenna. The ¼ wave for 2m is a surprisingly good match for a ¾ wave on UHF - very simple to produce, and very cheap. As for ch25's design - it is a ¼ wave for 2m, with two parasitic half waves for UHF - I'm not quite sure what the radiation pattern would be, but certainly not circular - not sure what it's advantages are - it doesn't appear to have too many advantages, and mounting it would be interesting? Just quick modelling in Mmana. 145 MHz dipole will give 75 Ohm, j6 1.5 SWR. Low elevation. Same dipole on 432MHz 78Ohm, j-52 2.5 SWR. 48 degrees elevation. GP with 90 degrees radials is even worse. It matters on RX too. Antenna I suggested can be tuned both bands. Omni radiation.